Yellow Gerberas mean “I will try harder” and Gladiolus signifies “innocence”. The two flowers are same, but they indicate varied meanings. A good luck wish with innocence can never go in vain. 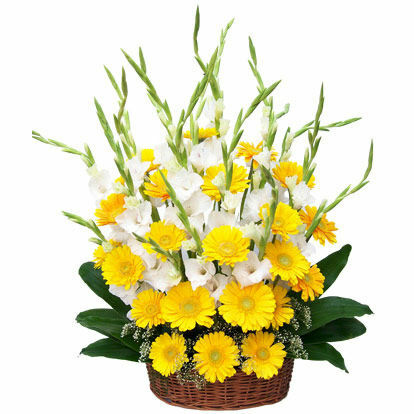 If you want to, wish your loved ones for something special, then this charming and gorgeous bouquet of wonderfully arranged with20 yellow Gerberas and 20 Gladiolus surrounded with green leaves in a basket is perfect.